Former School of Biomedical Sciences PhD student Dr Danielle Ingle has been named a finalist in the 2019 Premier’s Awards for Health and Medical Research. Dr Ingle’s research, which combined traditional clinical microbiology and cutting-edge genomic methods, has been recognised in the 25th year of the prestigious awards. 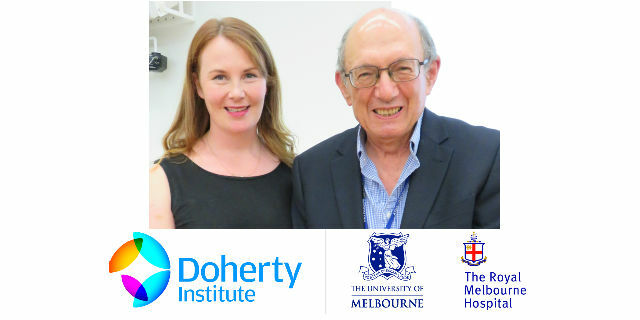 Her research through the University of Melbourne, based at the Peter Doherty Institute, investigated the emergence of bacteria that causes serious diarrhoeal disease in humans – particularly in children under five. Supervised by recently retired Professor Roy Robins-Browne (pictured) and Professor Kat Holt, Dr Ingle’s research was at the forefront of using whole genome sequencing technology to explore emerging pathogens, in particular atypical enteropathogenic Escherichia coli. Working with data collected through the Global Enteric Multicentre study based in South Asia and Sub-Saharan Africa, Dr Ingle’s project had significant impact both in the basic research and public health spaces – providing a blueprint for exploring new enteric pathogens. Most notably, she developed new tools that have been implemented in public health labs around the world, highlighting the translational impact of the project, and providing important baseline data for the prevalence of antimicrobial resistance. Winners will be announced on 25 March, 2019. Dr Ingle shares her research findings in our five-part video series: 'In Conversation with Prof Roy Robins-Browne and Dr Danielle Ingle'. What's involved in a PhD at the Faculty of Medicine, Dentistry and Health Sciences.